description: NCEI home page with information, data access, and customer support contacts. abstract: This dataset is a compilation of in situ daily meteorological observations for Kazakhstan within the framework of joint efforts to create Global Daily Climatology Network (GDCN) among the Kazakhstani Scientific Research Institute of Ecology and Climate of the Ministry of Environment Protection of the Republic of Kazakhstan, All-Russian Research Institute for Hydrometeorological Information-World Data Center of the Federal Service for Hydrometeorology and Environmental Monitoring, Obninsk, Russian Federation, and NOAA National Climatic Data Center, Asheville, North Carolina. 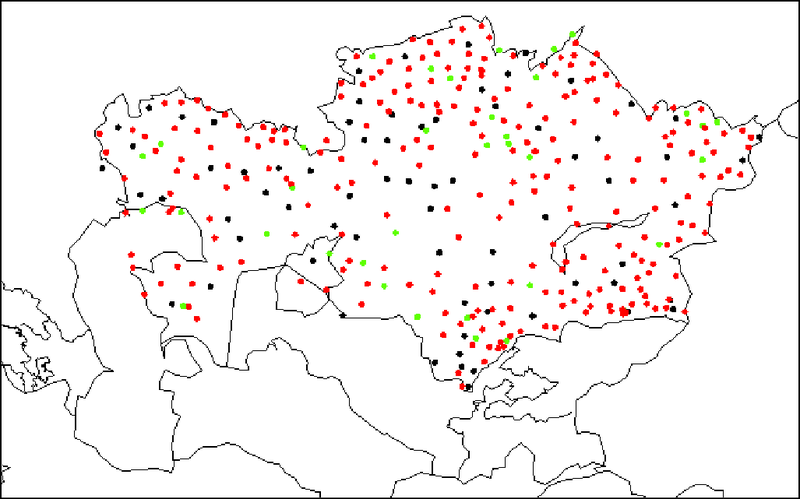 Transmitted information was verified versus the original data holdings at the national hydrometeorological archives of the former USSR (prior to 1991) and The Republic of Kazakhstan, and appended when it was necessary. The number of stations varied over the period of record. Variables in the dataset include sea level and station pressure, surface air temperature, relative humidity, wind speed, and observed precipitation. description: Scientific paper by Groisman and Rankova (Int. J. Climatol., 20, 657-678) describing homogenization techniques on precipitation data to create DSI 9814a..
description: Data in this archival information package are not currently available for public download from NCEI. Please contact NCEI Information Services directly for access to these data. description: Data documentation manual from May 25, 2008, published by the National Centers for Environmental Information. statement: All data were compiled from daily meteorological observations captured in Kazakhstan.